"This is the ideal storm for Mars science," said Jim Watzin, director of NASA's Mars Exploration Program at the agency's headquarters in Washington. 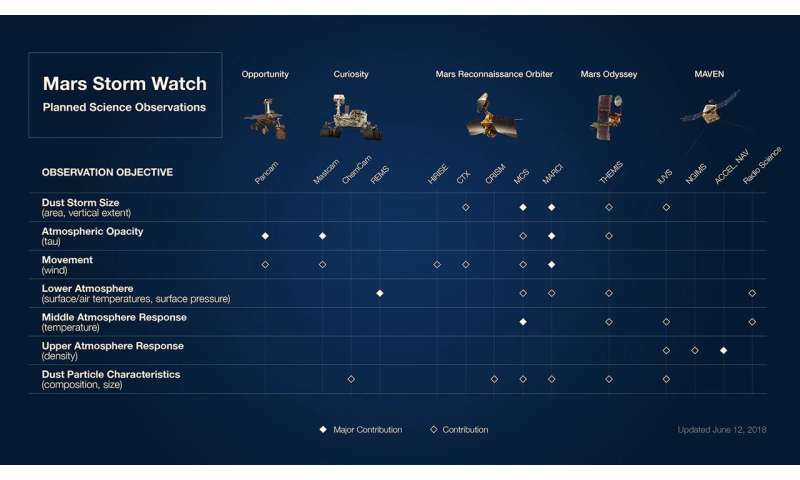 "We have a historic number of spacecraft operating at the Red Planet. Each offers a unique look at how dust storms form and behave—knowledge that will be essential for future robotic and human missions." The current storm above Opportunity, which is still growing, now blankets 14 million square miles (35 million square kilometers) of Martian surface—about a quarter of the planet. "Each observation of these large storms brings us closer to being able to model these events—and maybe, someday, being able to forecast them," Zurek said. "That would be like forecasting El Niño events on Earth, or the severity of upcoming hurricane seasons." NASA's two other orbiters—2001 Mars Odyssey and MAVEN (Mars Atmosphere and Volatile Evolution)—also provide unique science views. Odyssey has an infrared camera called THEMIS (Thermal Emission Imaging System) that can measure the amount of dust below it; MAVEN is designed to study the behavior of the upper atmosphere and the loss of gas to space. Science happens on the ground as well, of course. 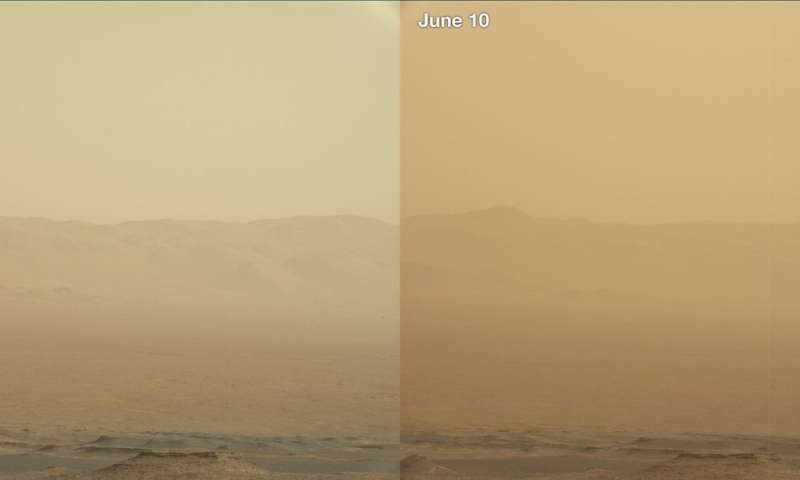 Despite being on the other side of the planet from the evolving dust storm, NASA's Curiosity rover is beginning to detect increased "tau," the measure of the veil of dusty haze that blots out sunlight during a storm. 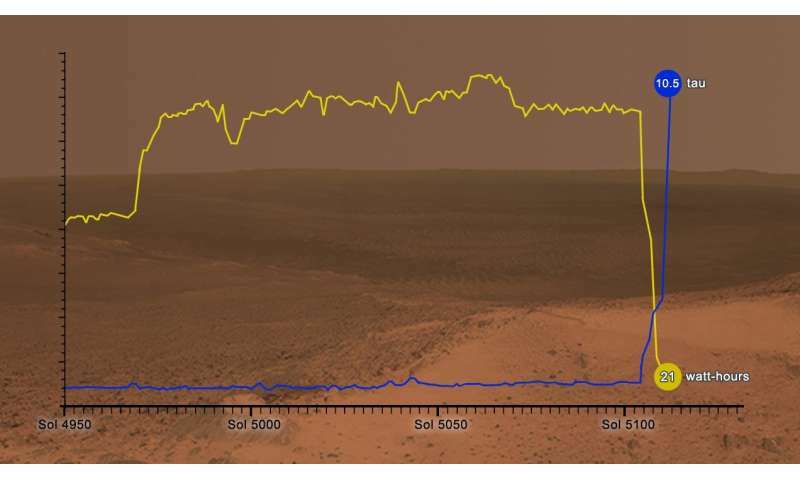 As of Tuesday, June 12, the tau inside Gale Crater was varying between 1.0 and 2.0—figures that are average for dust season, though these levels usually show up later in the season. 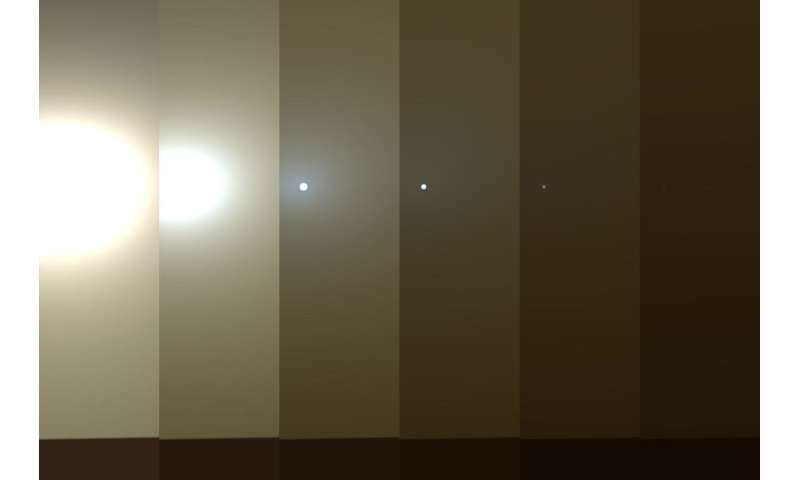 Since 2007, Mars scientists have been patiently waiting for a planet-encircling dust event—less precisely called a "global" dust storm, though the storms never truly cover the entire globe of Mars. In 1971, one of these storms came close, leaving just the peaks of Mars' Tharsis volcanoes poking out above the dust. Obviously global warming is making these storms worse. Obviously, global warming is not an issue on Mars. Nice to see NASA concentrating on space exploration instead of whoring themselves out to the global warming cabal. Oh TB, I hope you're going to get treatment for that blackeye your pimp left you with. Marmbridge; the university town Cambridge university is working on its plans for their universty in the capital city Marmbridge which is going to be a model of Cambridge complete with Kings and kings parade and just like the real city, Marmbridge is going to be cycling utopia they have yet to draw up plans to tackle the world wide dust storms and the environmental damage they do to the stone work of the ancient copies of those irreplaceable colleges in Cambridge, in the meantime they are drawing up plans for a massive cleanup and dust filters for the soon to be first human Martians to set foot on those dusty valley's. So you are saying Mars is not a globe?